← Revisit: Ancient bridges in France . . .
A typewriter, a teacher and a teenager . . .
During my tenth year of schooling I enrolled in a typing class. 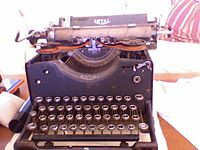 I would like to say that my interest in typing was an effort to hone my writing skills and perhaps follow in the footsteps of the great authors, giants such as Hemingway, Steinbeck, Twain, Orwell, Vonnegut and lesser lights. I would like to say that but I will not say it because it would not be true. I had a rather strong ulterior motive to learn how to type. There were several typing classes taught by different teachers, and I chose the class taught by the one that was said to be the best teacher of the group. No, belay that. I can’t say that because it would also be untrue, and I cannot tell a lie, at least not in this instance. This is a WordPress blog and I do have my standards. I chose a specific teacher’s class because she was quite young, unmarried and exceptionally attractive, and the rumors that swirled around the campus of the original Stephen D. Lee High School in Columbus, Mississippi in that stellar year of 1948 were that she had been known to dally with some of the students. Well, actually, the talk in the restrooms reserved for male students was that she—well, it was not only talk but it seemed to be confirmed by some of the writings on the walls of the stalls—the talk intimated that she dallied with students, and in fact some of the images depicted such dallies, crudely of course but rather effective. Walls of the stalls has a solid resonance, don’t you think? Quite expressive, and also quite masculine! Well, actually, the rumors and the writings and the crude images drawn indicated that she not only dallied—she was said to have actually diddled some of the students. The writings and graphics were routinely obliterated by the janitors but mysteriously re-appeared, often on the same day they were removed. I attacked that state-of-the-art upright finger-operated non-electric Royal Standard typewriter with all the fervor a fifteen-year-old lad could muster, and after three or four weeks I was typing 65 words a minute, and that was after taking off 10 words for every error made, regardless of its nature, whether a misspelling, a wayward comma, a failure to capitalize or missing a period—hey, that last error has a double meaning! I felt in my first week that the rumors might have a modicum of truth—judging from my observations there was definitely some meat on those bones—the rumors, that is. I know, I know, that term could apply to the typing teacher and in fact did apply to the typing teacher, and it was distributed in all the right places in the right amounts. Before the second week ended I had convinced myself that the rumors were probably true, and I had also convinced myself that the teacher was perhaps considering me a possible candidate for diddling purposes. That quite young, unmarried and exceptionally attractive typing teacher was a hands-on instructor—literally. She would often stand behind students, both males and females and reach across a shoulder to point out errors and perhaps to demonstrate how to retrieve the carriage to start another line, with the other hand on the student’s other shoulder to help maintain her balance—the teacher’s balance, that is. I believe I made many, perhaps most, of my errors while she had her hand on my shoulder. I was a cutie at fifteen and I can prove it. One day when I was around 10 or 11 years old I was with my mother at a grocery store, and I can vividly recall a remark made by the check-out lady. She asked my mother if I was her boy and my mother replied in the affirmative. The lady then said, “He’s a real cutie. He’ll be a heart-breaker and a home-wrecker when he grows up.” Don’t bother to ask whether that prophecy came to pass. I will stand on my rights under the Fifth Amendment to the Constitution and refuse to answer on the grounds that it may tend to get me into all sorts of hot water and incidentally, of course, would tend to incriminate me. Also incidentally, the image on the right is not me—that’s Michelle Pfeiffer, a gorgeous lady that realized her true calling while working as a checker at a California supermarket. I used this photo to simulate a grocery checker—Michelle probably dressed differently at work. That heart-breaker and a home-wrecker remark had the same effect on me that I felt several years later when a young girl out in west Texas told me I looked just like Van Johnson. I blogged that incident, and that posting has a lot more than that to offer—it’s worth the read, and you can find it by clicking here. I do not want you in my class. Do not return to my classroom on Monday. Find another typing class or a different subject to fill this period. Is that clear to you, or should I repeat it? The mists of time have also shrouded my response to that measured order. I have a feeling that my only response was to vacate the premises as quickly as possible. I probably squeaked out something similar to Yes, m’am, it’s clear to me and no, you don’t need to repeat it, and immediately made my exit, out of the class and away from that ugly broad—I mean, I made my exit away from that quite young, unmarried and exceptionally attractive woman. On Monday morning I fully expected my homeroom teacher to tell me that my presence was urgently required in the principal’s office. However, she called the roll and then released us to head out for our classes. I waited until the others left and told her that I was not doing well in my typing class and needed to replace it with something else. Without questions or comment she scheduled me to a second hour of biology, sentencing me to two hours, back to back, under the tutelage of a well-past-middle-aged woman that dressed in multiple layers of clothing, wore heavy black stockings rolled down to midway between knee and ankle and had a face remarkably resembling a turtle—in fact that’s what the students called her—old lady turtle. Actually, I thought she was kinda cute, but of course I have a soft spot in my heart for turtles—in fact, I once had one for a pet. That’s my story about a state-of-the-art upright finger-operated non-electric Royal Standard typewriter and a class taught by a quite young, unmarried and exceptionally attractive woman who turned out to be an ugly old unappreciative toad that I wouldn’t touch with a 10-foot pole—not that I had anything that resembled such an item. My only regret concerning this situation is that neither she nor I will ever know what we missed—well, I’m pretty sure I know what I missed, but I can’t speak for her. In the words of the poet John Greenleaf Whittier, For all sad words of tongue or pen, the saddest are these, it might have been. The poet had another saying that had I known it then I would have told that typing teacher this: The joy you give to others is the joy that comes back to you. With that included in my proposition my weekend might well have been remarkably more memorable. Where ever she is now, whether she is still in this realm or has left it for another realm, I wish her well. Great posting, King! I hadn’t heard this story before. 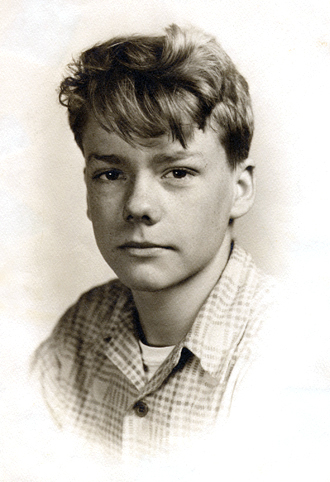 And yes, you certainly were a handsome lad (still are). Kinda sad that when you made your move, you lost any chance of just sitting in class and dreaming about her—she threw you out! I love that Whittier quote, by the way! Hey, not much changed—I still had my dreams, and the images I conjured up, in class or away from class were, and still are, a far cry from the image my typing instructor (instructress?) presented in the classroom. Thanks for visiting and thanks for the comment.